Have you an elderly parent or loved one? Perhaps you yourself have thought about creating an enduring power of attorney to make provision for a day when you become incapacitated. If so, the need for a power of attorney may arise at some stage. A power of attorney is a legal document which allows a person (the donor) to give powers to another person (donee/attorney) to take certain actions on behalf of the donor. an Enduring Power of Attorney. A Power of Attorney can only be created by a donor when he is not mentally incapacitated and understands what he is doing. It can grant a specific power-for example, to buy or sell property- or general powers to the donee. 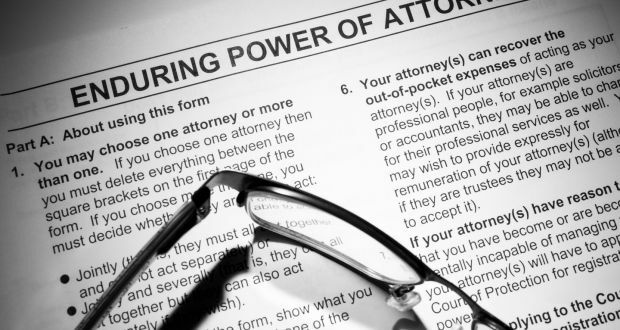 A form to create a general power of attorney can be found here in the Powers of Attorney act, 1996. An Enduring Power of Attorney(EPA) comes into being when a person becomes incapacitated. It allows the donee to make personal care decisions on behalf of the donor when the donor becomes mentally incapacitated. Generally, anyone can be appointed an attorney (but there are exceptions eg a bankrupt or person under 18 years), but creating an enduring power of attorney is more complex than creating the general power of attorney. Creating an enduring power of attorney will involve a doctor and solicitor. It can only come into effect when certain procedures have been followed. include a statement from a solicitor that the donor had the capacity to make the enduring power of attorney, and that the donor was not acting under any duress or undue influence. At least 2 people must be notified of the making of the enduring power of attorney, and these people cannot include the donee (attorney). One of the notice parties must be a spouse or civil partner; if there is none, a child must be notified. If there is no child a relative must be notified. The EPA only comes into force when it is registered. This involves an application to the Registrar of the Wards of Court in the High Court and this can only be made when the donor is, or is becoming, mentally incapable. There must be a medical certificate confirming that the donor is incapable of managing his affairs. An EPA can give general powers, including personal care decisions, to the attorney, or specific powers. All decisions must be taken in the best interests of the donor and the donor’s family, and carers, must be consulted. Personal care decisions includes things like where the donor should live, their dress and diet, who they should see and not see, and so forth. A donor can revoke an EPA anytime before it is registered; however, if it is registered an application must be made to the Court to have it revoked. An EPA ceases on death of the donor, and there are also some other limited circumstances where the enduring power of attorney will be terminated. The relevant legislation dealing with powers of attorney is the Powers of Attorney Act, 1996. If you want to create a power of attorney or an enduring power of attorney contact Terry to make an appointment to discuss.